Herringbone parquet floors, floor-to-ceiling windows, and contemporary Louis XV style, this French salon-style apartment has a classic but updated look. The main living space features a large seating area as well as a dining table lit up by the room’s natural light. 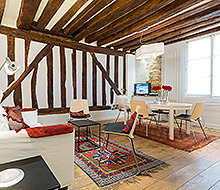 All the soft furnishings are custom made by Gilles Nouillhac, using high-end Nobilis fabrics and trimmings. Nouillhac’s work combines original French furniture-making techniques with an updated style to produce the refined contemporary looks you see here. The kitchen has a streamlined style with a titled backsplash. The cookware is All-Clad stainless, there is a dishwasher, and Nespresso maker. The master bedroom maintains the style of the main salon; a textured quilt covers the plush queen size bed and silk curtains drape the double window. The second bedroom, with two single beds, pops with color. Unique headboards and under-bed storage make this a comfortable and clever space. The master bath has a rain-shower head, deep bath, stone tiles, and marble counter tops. Well lit with a large mirror, this bathroom also features a towel warmer! 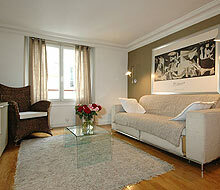 The flat is in a great area close to the Seine River and close to Metro stops and Bus stops. 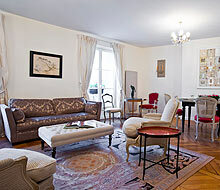 Walking distance to the Louvre and Notre Dame. The flat was clean and the maid service came in the middle of our stay. 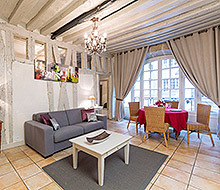 Paris for Rent could not get our TV working but Patrick and the on site attendants tried their best to fix the problem and were very apologetic regarding the problem.